Thoroughbreds are fleeting spectacles: at their peak one day, gone the next. We experience them for one, maybe two seasons – hey, if we’re lucky, sometimes even a whopping three or four seasons! Efficient wins the 2009 Turnbull Stakes, his last victory to date. Longevity is not one of racing’s strong selling points. Invariably, racing’s fans become attached to certain horses, but it is hard to get too involved when the farewell comes so soon after the acquaintance is made (not that it stops racing fans, the greatest sentimentalists of all, from forming attachments!). Racing’s trainers provide enough familiarity from year to year, but it is the horse that provides much of the character. By following the career of, say, an AFL or NRL player, you may get 10 to 12 years to see them ride their professional rollercoaster, whatever it may entail. You cheer as they reach their lofty heights and you despair as they plunge to dark depths. In horse racing, the same process applies but over a much shorter timeframe. Therefore, when a horse can race for season upon season, maintaining their form at the highest levels, it is likely they’ll be among the more popular horses to grace the track. Take a horse like More Joyous. She could easily have been retired at the end of her four year old season, having raced for three seasons. She would have had five Group 1s and eight Group 2s to her name, fantastic statistics in anyone’s book. But she has raced on. She is now in her fifth season of racing and her popularity is at a higher level than ever. Owner John Singleton has raised the possibility that she could race for another couple of seasons, a move sure to see bring about more adoration. Which brings me to Efficient. Ah, Efficient. There aren’t too many horses as popular as the nine year old grey. The 2007 Melbourne Cup winner is set to venture to Sydney for the second time this weekend, tackling Saturday’s Group 1 The Metropolitan (2400m) at Royal Randwick. Trained by Robert Hickmott and owned by Lloyd Williams, Efficient has had a tough, injury-plagued career which has reduced him to only 29 starts. The last 22 of these have been at Group 1 or 2 level. He is entering his seventh season of racing (including the 2010/2011 season which he missed through injury), a remarkable feat. It’s not quite as many seasons as the evergreen Mustard (who ran for an incredible 13 seasons), but then again, Mustard couldn’t maintain his form in stakes races over such a long period as Efficient. His record at staying trips is phenomenal. He’s been up to 2400m and beyond three times for wins in the 2006 Victoria Derby (2500m) and the 2007 Melbourne Cup (3200m), as well as a game second in this year’s Sydney Cup (3200m). He is likely to get his fourth opportunity this weekend. He will carry 58kg, a clear but deserved topweight. He makes the leap from 1600m to 2400m, but given the month between runs, there is little doubt he would have built up fitness at Macedon Lodge. Efficient is a day-by-day proposition, and it is probably premature to consider him a genuine chance of retaining the Melbourne Cup for the home team. Nevertheless, even if Bart Cummings was to make it 13 Melbourne Cups, it is unlikely there would be any more popular winner than Efficient. 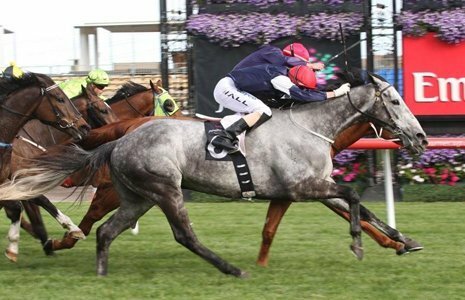 To win two Melbourne Cups six years apart, given the substantial changes to the race in that time, would place the grey among the annals of the greats. The reality is, there is a very remote chance it will happen – he is out to $51 with TAB Sportsbet, while he is at 110s on Betfair. And there is an argument to suggest he should be even longer in the market. No nine year old has ever won the Melbourne Cup. The closest nine year olds have come in recent times came with Persian Punch, third to Ethereal in 2001, and Efficient’s former stablemate Zipping, fourth to Americain in 2010. But the dream is still alive, and for as long as he remains a live Melbourne Cup chance, he is likely to remain the sentimental favourite among punters across Australia. He is guaranteed a run in Australia’s greatest race and a win this weekend in The Metropolitan would be nothing more than a bonus. Win or lose, however, it could be the prelude to one of the more unique Melbourne Cup stories in the history of the race. Efficient is a $31 chance for The Metropolitan, with Hill Stakes winner Lamasery a $4.20 favourite.